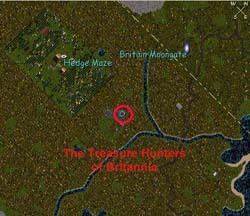 Coordinates: 51°S 1°E – TrammelThe Treasure Hunters of Britannia (THB) call a beautiful and helpful guild tower, just east of the Hedge Maze, home. A guild tower geared toward the needs of everyone in their field of finding, digging, unlocking and stuffing their pockets full of treasure! THB’s Guild Tower is fairly new to our lands, but the guild is not. Founded August 9th, 1999 on Great Lakes, Treasure Hunters of Britiannia is a professional guild for treasure hunters, based on the ideals of uniting T-hunters and providing reliable services to the adventurers of Britannia. 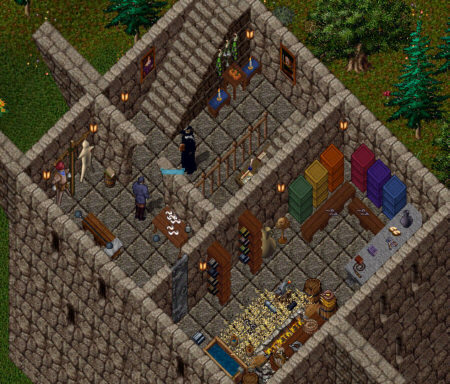 Blackheath, guildmaster of THB, heads up a large group of active members and owns the guild tower. Walking into THB Guild Tower, you will be greeted by a small group of vendors offering various craftable items. A runebook library dedicated to the needs of treasure hunters is tucked into the smaller room on the first floor. Runebooks filled with the locations of hunting spots for monsters that are likely to yield treasure maps are here. There is a section of runebooks for treasure hunting, dungeon lock-picking, and to most of the buildings in our cities. The second floor of the Treasure Hunters of Britannia Guild Tower is where the guild keeps their stone, buried under piles of gold, silver, tattered maps, sodden messages in bottles and gems. A long, dark dining table sits a room away, waiting for the hunters to gather and enjoy a well-deserved feast! Climbing the stairs to the top, your nose will be tickled by the scent of flowers. 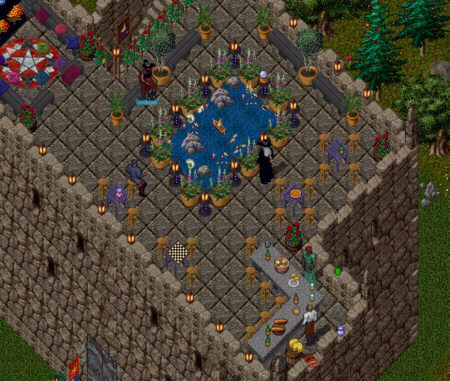 When you arrive on the roof, a beautiful gathering place awaits you. A crystal blue fish pond trimmed in purple flowers and glowing lanterns is the center of the tower’s roof. Benches, tables and chairs are spread out, welcoming guests and guild members. The full bar is run by two barkeeps, standing ready to serve patrons and send them off to relax by the cozy fireplace with pillow-lined benches. When guild members aren’t out slaying monsters in hope of finding a treasure map or gathered at the guild tower, you may find them hosting their “Open Hunt Day,” when they volunteer to dig up maps brought to them by the public, free of charge. 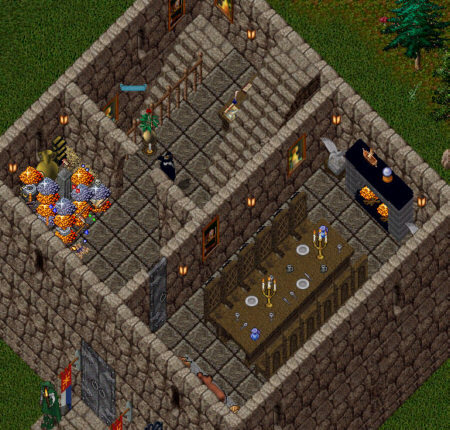 THB leaves their guild tower open to the public at all times and sometimes you may even find a knowledgeable guild member available there to answer your treasure hunting questions. To get more information about treasure hunting and the Treasure Hunters of Britannia, visit their website. 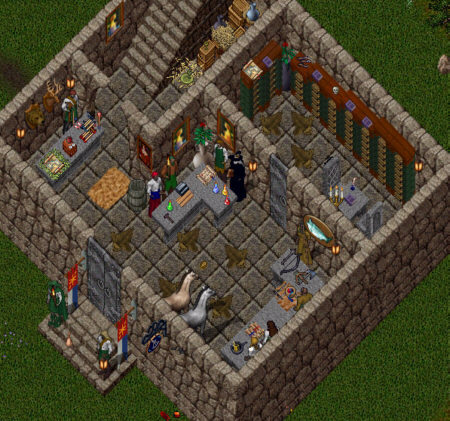 Kyra’s comments:Every treasure hunter in the lands should have a rune to this guild house. THB members are helpful and friendly, the lock-picking library is a must for any aspiring treasure hunter and the library full of runes marked to places to hunt for maps or work on your skills. Everyone who enjoys peeking in houses is going to love the pond on the roof. It is the best one I have seen yet! Rikus’ remarks:What a great tower… THB has setup the ultimate training center for anyone wishing to take up treasure hunting. The theme of this tower and this guild is clear and well-portrayed. I love the treasure pile around the guild stone and the workout facilities! THB is a large, multi-shard guild that is always willing to help younger hunters hone their skills. Their history, and this tower, is proof of that. Thanks for everything you have put back into the community, THB! Keep up the great work!